In the year 1805, the young and enthusiastic Horatio Hornblower is given his first command as Captain of HMS Atropos. A 22-gun sloop, it is hardly the biggest ship in the navy, but undeterred, Hornblower boards the Atropos in eager anticipation of the voyages to come. Acting as flagship during the funeral procession for Lord Nelson, Horatio's first endeavour is to pay tribute to the country's fallen hero. However, his peaceful ventures are at an end when he is confronted with the alarming news that a large Spanish frigate is quickly descending upon his considerably smaller ship. Determined to return to land unscathed and triumphant, Hornblower fights valiantly in this next instalment of C.S. Forester's naval series. ©1953 Cassette Productions (P)2014 Audible, Inc.
A different tack but good none the less. Thumbs up for sure now onto book 5.
another brilliant novel from cs forester loved every minute of it ,wonderfully narrated. It was so good listened to it twice. Read by Christian Rodska. Once he has read to you, no one else will do! There are dull parts spread throughout, and especially in the beginning. But all together it's a very atmospheric adventure. Great performance by Christian Rodska. Hornblower and his own command continues to grow in character. Not as fast paced as some of the other books but with some unusual story lines. This book is a little slow and drawn out in the early section but pays good attention to the traditions and protocols of the RN. The story does pick up as Hornblower is sent into service and builds to a climax expected of a Hornblower story. I had read this as a boy so was a bit dubious about returning to this series of books, in case they had dated too much. However, for a engaging listen that can carry you through boring air/train/car journeys it was fine, especially as there is a lot of interesting historical and scientific detail, and not too much swashbuckling. The narrator is also very good at making it come alive. The characterisation is great - deep and complex. The plots are a series of mini-stories but held together by longer threads. The action is well-described and there are many elements of background descriptions too. Forester is a great writer and the narrator, Christian Rodska brings out all the nuances of the story. Rodska's narrative is again in true form. The story will keep you spellbound as Hornblower fights the enemy and his own inner demons. If you could sum up Hornblower and the Atropos in three words, what would they be? What other book might you compare Hornblower and the Atropos to, and why? Any of the other Hornblower series. They are all challenging in that Hornblower varies between being a super hero and someone very unsure of himself which is probably how we all live our lives. I love Christian Rodska's voice and his ability to portray characters so clearly that you can almost feel you know them. I first came across him reading in the Falco series and really miss his voice in the later books. I deliberately looked for other books he had read which is how I came across the Hornblower stories. It makes me chuckle rather than laugh and although this one did not make me cry others in the series have. Still buying the later ones so can't comment on those. If you like Hornblower then you will not be disappointed. The story is well paced and as usual the author shows his knowledge of the period bringing 19th century England alive. 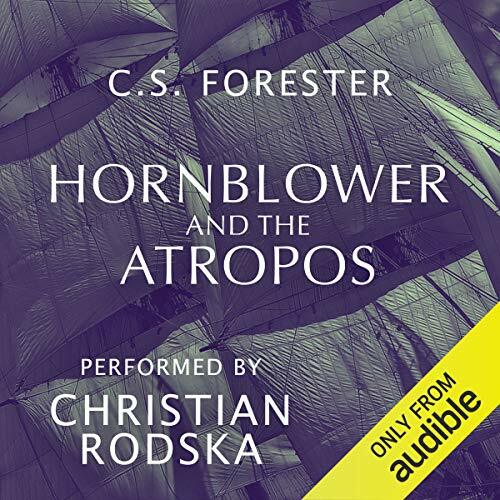 Another great Hornblower title, read brilliantly by Christian Rodska. A little less naval action, but still plenty of adventure at sea.